Luke, a special, inquisitive little boy, lives and plays along the shores of the South Carolina coastline. He is kind, sensitive, and has the unique ability to communicate with all the critters around him. There aren’t many children to play with around the area, and the turtles, sea birds, raccoons, fish, and crabs, become his dearest friends. The animals have lots of interesting things to say, but when Mother Turtle asks Luke to help save her eggs, he takes this mission very seriously. Her babies' lives depend on it! He realizes it doesn’t just end there; he must enlist the help of all his critter friends to ensure the baby hatchlings make it down to the ocean water safely. Who will pitch in to make sure their long and dangerous journey from egg to ocean is a successful one? Can everyone work together to save the baby turtles or was it all for nothing? 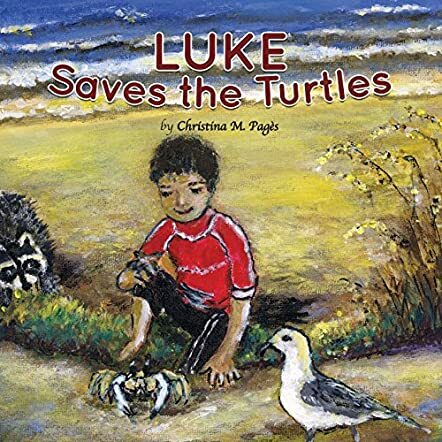 Luke Saves the Turtles by Christina M. Pagès is a children’s book that will inspire many readers of all ages to be mindful and appreciative of the beauty and magic of nature. Luke Saves the Turtles is the perfect story to teach adults and children alike about the importance of honoring nature and our precious eco-system. It’s also a book that brings plenty of humor, factual science, imagination, friendship, determination, and compassion to the mix (all great things to teach children). This is an enjoyable, interesting read from start to finish and I learned some really cool things about sea turtles! Five stars.